Leading Without Power is a book by Max De Pree that discusses his life and career and is also considered to be a guide for new style of leadership. Research papers that explore the book Leading Without Power by Max De Pree are custom written for MBA or business majors. You can have the book used in a research paper or have a book review done on Leading Without Power. 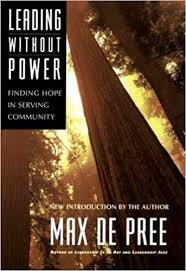 Max De Pree's Leading Without Power: Finding Hope in Serving Community is part touchy-feely reminiscence about the author's personal life and career and part New Age-like empowerment guide for volunteerism. A business or MBA level research paper on Leading Without Power begins with the introduction and De Pree's saccharine tone and inaccurate generalities set up the book to push for some new spirit of volunteerism among readers. The book first describes what De Pree calls "places of realized potential," organizations where people "fit in." It describes several examples of organizations he believes are places of realized potential, ones that have "started a movement" and why people serve. The book then bogs down into vague pronouncements on the ethereal qualities of "leadership," as if a reading will instill in a person the sudden potential to become Albert Schweitzer. De Pree offers the book to be a guide for a new style of leadership, however he provides anecdotal evidence to support his banal pronouncements. In the end, De Pree evidences a fundamentalist Christian undertone to the entire spirit of volunteerism, where the best organizations have "a sign of God's presence" (179). All in all, De Pree's slim volume fails to offer any concrete information, but can be relegated to that brand of business book that seeks to "empower." New Age Spirituality - New Age Spirituality research papers discuss the expression of personal belief based on the wide umbrella of practices and beliefs described as New Age. New Age Religions - New Age Religions research papers discuss the religions that emerged from the new age movement in the early 1970s. Order a research paper on New Age Religions from Paper Masters. Employee Empowerment - Employee Empowerment MBA research papers write on creating effective organizations for the Undergraduate or MBA student. Leadership and Motivation - Leadership and Motivation Research Papers look at a preview of a paper order placed on a self improvement essay, and the specific requirements placed. Leadership Development - Leadership Development Research Papers preview a sample of an order placed for a Phd proposal. Application of Leadership Principles - Application of Leadership Principles research papers analyze the principles of an actual work situation that involves leadership. Management Versus Leadership - Learn the difference between management verses leadership in a custom research paper from Paper Masters. Psychodynamic Leadership Approach - This paper will look at the Psychodynamic Leadership Approach as to why leaders are more effective when they have insight into their own psychological makeup. Steward Servant Dynamic in Leadership - Steward Servant Dynamic in Leadership Research Papers examine leadership principles that have developed over the last three decades. Jesus CEO : Using Ancient Wisdom for Visionary Leadership - Jesus CEO : Using Ancient Wisdom for Visionary Leadership research papers discuss a book by Laurie Beth Jones discussing the ways in which Jesus was a CEO. Leadership in Human Resources - Leadership in Human Resources Research Papers discuss a paper ordered on an interview on what they understand about Human Resources responsibilities. Analysis of Leadership - Analysis of Leadership research papers discuss a leader as depicted in The Road to Guilford Courthouse by John Buchanan. Whether Leaders are Born or Made - Born or Made Research Papers discuss a leader or leadership traits born or made in a person. Art of War - Research Papers on The Art of War can be custom written by the expert writers at Paper Masters from any angle or for any topic you need. Murdering McKinley - Book reviews on Murdering McKinley: The Making of Theodore Roosevelt's America can be custom written by Paper Masters. The 7 Habits of Highly Effective People - The book review should include examples of the books usefulness in the business world. One of the foremost experts in the field of leadership training is Dr. Managing for the Future: The 1990's and Beyond - Managing for the Future research papers overview Peter F. Drucker's business management book. Riding the Waves of Culture - Riding the Waves of Culture Research Papers explore a book for managers and corporations with a step to step guide on how to implement business plans in a way different cultures can accept. A sample Leading Without Power research paper discusses the life and career of Max De Pree in his book Leading Without Power.